The Tasering of a race relations adviser has "put a wedge" between the police and Bristol's black community, campaigners have said. 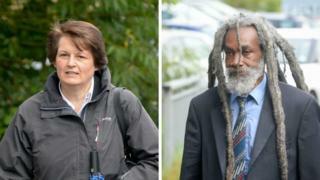 On Wednesday, PC Claire Boddie was cleared of using "unreasonable force" against Judah Adunbi, 65, when she discharged the device without warning. Supporters said concerns remained about an innocent black man being targeted. Avon and Somerset's police chief said officers needed "to feel confident to stop people". Black rights campaigner, Desmond Brown, said the incident has hampered work to improve local relations. "We all saw what happened. Most people would see she fired her Taser out of fear and she should have been disciplined for it," he said. "We expect more integrity from our police officers." Samir Seddougui, from charity Stand Against Racism and Inequality (SARI) said: "It is fully appreciated that policing is a challenging role. "However, Judah is not alone in his concern that there remains disproportionality in the policing of our black communities." Avon and Somerset chief constable Andy Marsh said: "I need officers like Claire Boddie and her colleagues to feel confident to stop people if they think they are wanted." He also said the confrontation had caused a "great deal of hurt" among police but officers needed to keep the streets safe. "Every single day my officers attend 116 violent incidents, 550 last year involved weapons. It's a dangerous and unpredictable job," he said. Mr Marsh also said the percentage of student officers at his force were from a BAME (black, Asian and minority ethnic) background was above the national average. Mr Adundi is now pursing a civil claim against the police force over the incident. PC Boddie, an Acting Sgt at the time, was on duty with a colleague in the Easton area when they mistook Mr Adunbi for wanted man Royston McCalla. After a confrontation, she eventually discharged her Taser, and Mr Adunbi was struck in the face by one of its barbs. An internal disciplinary hearing found Mr Adunbi was "at times aggressive and threatening" towards the officers and cleared PC Boddie of gross misconduct. She was also cleared of assault charges at Salisbury Magistrates' Court in May.